Australia 5-305 (Phillip Hughes 112, George Bailey 89, David Hussey 60*, Angelo Mathews 1-46) beat Sri Lanka 198 (Dinesh Chandimal 73, Tillakaratne Dilshan 51, Clint McKay 4-33) by 107 runs. The talented Phillip Hughes sparkled on his debut while dispatching a ODI ton against Sri Lanka that led Australia to a marvelous victory in the first match. The Kangaroos powered 305 runs for the loss of 5 wickets at the end of the allotted 50 overs and the Islanders were bowled out for 198 runs in 40 overs. 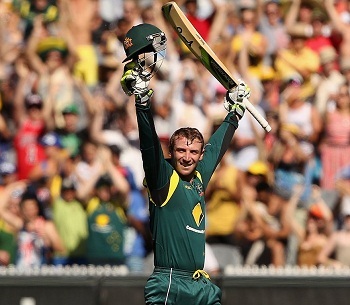 Phillip Hughes (Australia) was declared ‘Player of the match’ for his brilliant century in his maiden ODI. Phillip Hughes, Aaron Finch and Usman Khawaja made their debut from the home side in the limited overs game. The first One Day International of the five match series was played at Melbourne Cricket Ground, on Friday, January 11, 2013. Earlier, George Bailey, the Australian skipper, won the toss and opted to bat on a good looking track. The innings was opened by Aaron Finch along with Phillip Hughes and they made a nice start by accumulating 52 runs in the first ten overs with 6 fours from the latter. Finch was gone in the next over for 16 when Usman Khawaja was run out for just three runs as the score reached 72. George Bailey joined in next with Hughes who attained his fifty on the first ball of the 18th over. Bailey hit the first six of the innings in the 27th over and Hughes added 8 runs in the next over with 2 fours. Bailey was playing a breezy knock and followed Phillip Hughes with the same result three overs later. Bailey got his fourth ODI fifty on the first ball of the 32nd over and Hughes thrashed his maiden ODI hundred in the 38th over. The third wicket partnership contributed 140 useful runs when Phillip Hughes was caught behind by Dinesh Chandimal off Lasith Malinga for 112 off 129 balls with 14 fours. David Hussey walked in next as George Bailey became the next victim after scoring 89 from 79 deliveries with 1 six and 8 fours. David Hussey remained unbeaten for 60 quick fired runs off 34 mere balls comprising 1 six and 6 fours as the Kangaroos piled up 305 with five wickets in hand at the end of the 50th over. Nuwan Kulasekara, Lasith Malinga, Angelo Mathews and Ajantha Mendis were the only wicket takers with one wicket each. The Lankan Lions lost two early wickets for just 17 runs in 5.2 overs when Upul Tharanga and their captain Mahela Jayawardene lost their wickets cheaply. The young Dinesh Chandimal got together with the experienced Tillakaratne Dilshan and they started the repair work. The score reached 39 runs in the first 12 overs as Chandimal hit a couple of fours in the next over. Dilshan kept on consolidating as Chandimal dispatched the first six of the innings in the 19th over and they touched the first hundred of the innings four overs later. Tillakaratne Dilshan achieved his 29th ODI fifty in the 25th over and was unluckily run out for 51 off 70 balls with 4 fours. The third wicket fell at 111 in 25.1 overs as Dinesh Chandimal got his 9th ODI fifty in the same over. Chandimal became the major partner as the wickets kept on sliding from the other end at regular intervals. 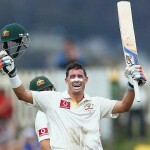 He was finally caught behind by Brad Haddin off Clint McKay for 73 from 95 with 1 six and 7 fours. Jeevan Mendis scored 20 as the innings of the visitors was folded back for 198 with 60 balls to spare. Clint McKay was the star performer with four wickets, Mitchell Johnson secured two whereas Mitchell Starc claimed one wicket. Australia triumphed with a huge margin of 107 runs and is leading the five match series 1-0. The second ODI will be played on January 13, 2013, at Adelaide Oval.